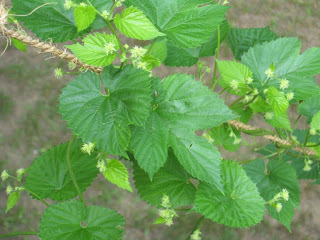 My second year hop plants are doing well in Massachusetts. My mother sent me these pictures, Cascade is the taller plant, Willamette is the shorter plant. Last year I only got about 1 oz of wet (undried) hops from both plants combined. Hopefully this year I'll get a big enough haul to at least get a full batch with them. In this picture you can see all of the little spiky buds, each (barring infection, bugs, and mistreatment) will turn into one hop cone. I am hoping they will be ready to harvest in a month when I'll be back in Massachusetts for week vacation, but they probably won't be ready until a few weeks after that. Where did you get the hops plants? Im in MA too and can't find them anywhere. Even on the internet. It is pretty late in the season to get them now, I got mine from http://freshops.com around the middle of March. Most places only have them from around the start of March through April or May. 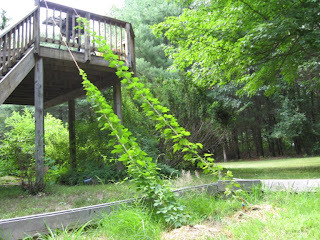 I’d suggest doing some reading and prepping your “hop yard” so you’ll be all set to plant them early next spring when the rhizomes become available again.